Take I-79 North to Exit 29 (New Castle/Butler). Turn Left (West) on Route 422. Follow Route 422 through 4 traffic signals. At the 5th traffic signal (E. Washington Street.) A-Plus mini-mart on one corner, CVS Pharmacy on another corner, turn right onto E. Washington Street. Follow East Washington Street down the hill and around the bend. At the bottom of the hill turn right on Court Street. Follow Court Street up the hill and around the back of the Courthouse to parking lots. Downtown New Castle Map. Courthouse Campus Map. Take I-79 South to Exit 99 (Route 422 West) toward New Castle. Follow Route 422 through 4 traffic signals. At the 5th traffic signal (E. Washington Street.) A-Plus mini-mart on one corner, CVS Pharmacy on another corner, turn right onto E. Washington Street. Follow East Washington Street down the hill and around the bend. At the bottom of the hill turn right on Court Street. Follow Court Street up the hill and around the back of the Courthouse to parking lots. Downtown New Castle Map. Courthouse Campus Map. Exit Turnpike at Interchange #15. Take I-80 East to I-680. Take I-680 south to U.S. 224 East. U.S. 224 East will become State Street. Continue east on State Street into the City of New Castle. Bear right onto Falls Street. At 3rd traffic signal turn right onto Mercer Street . At 2nd traffic signal turn left onto East Washington Street. Continue on East Washington Street through two traffic signals, cross bridge and through traffic signal at S.R. 108. Continue on East Washington Street until you start up the hill. At this point you will see a Veterans’ Memorial and two 3-story white brick buildings on the left. This is the Lawrence County Government Center complex. Turn left onto Court Street or County Line Street and look for parking at rear of buildings. Downtown New Castle Map. Courthouse Campus Map. Take Interstate 376 West to U.S. 224/State Street. Take State Street into City of New Castle. Bear right onto Falls Street. At 3rd traffic signal turn right onto Mercer Street. At 2nd traffic Signal turn left onto East Washington Street. Continue on East Washington Street through Two traffic signals, cross bridge and through traffic signal at S.R. 108. Continue on East Washington Street until you start up the hill. At this point you will see a Veterans’ Memorial and two 3-story white brick buildings on the left. This is the Lawrence County Government Center complex. Turn left onto Court Street or County Line Street and look for parking at rear of buildings. Downtown New Castle Map. 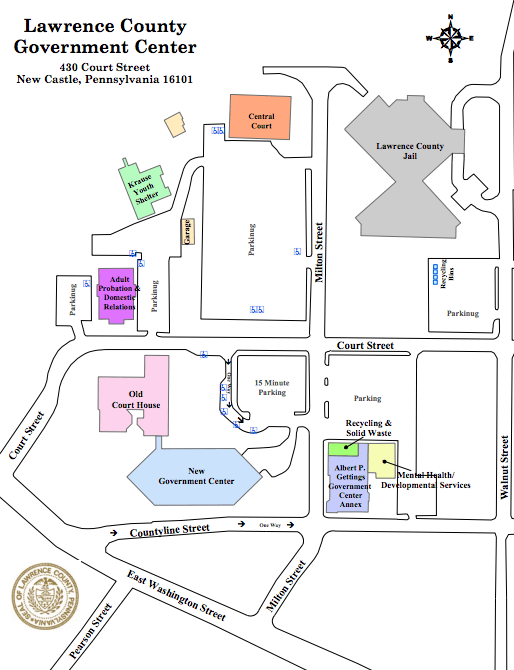 Courthouse Campus Map.